I am sure you have plenty of time on your hands right now. I can tell because so many of you are taking the time to read Snack Girl. December is my worst month and no one reads what I have to say. I could just let my dog type – sjjekdiguhe- THANK YOU, MILO! – and be done. I am a persistent person so I don’t hide in a hole. I think (deeply) about the type of assistance I can provide. 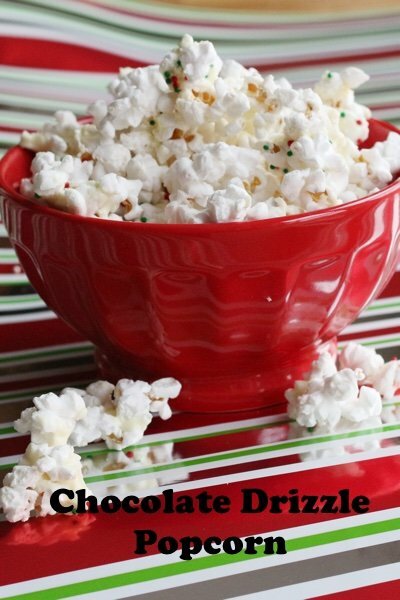 Chocolate drizzle popcorn!!! Take 2 minutes to pop the corn - another minute to melt the chocolate - mix them together – toss them in a container and everyone will think you are the BEST. Four minutes later you are out the door. You can use a bag of popcorn that you pop in a microwave. Avoid the “butter” flavored ones. Or you can pop it yourself on the stove or in a microwave in a paper bag. I used white chocolate in my popcorn – but that isn’t really chocolate. I do think it looks pretty. This is very inexpensive and will be appreciated with all the heavier treats being handed around. Give it a try (and let me know if you like it). I read but rarely comment...hehe! I love salty and sweet so this recipe is great for me. I buy one that is kettle corn with chocolate drizzle...YUMMY!!!!! I read too Lisa and never comment. You're not alone out there! I love your blog and bought your book and really enjoy reading it and trying the recipes. We're all here, Lisa! Honest!! Yum! You could also melt the candy cane flavored Hershey Kisses instead of chocolate chips! LISA, I look forward to your email every day, and all the comments on your day off. I just came home from 7 weeks at a rehab [nicer name for nursing home] for a fractured backbone and naturally my laptop came with me. Your daily posts were not only enjoyed by me but I also ended up sharing them with my PT's and Aides. I continue to forward any tips busy hard-working moms might find useful. Thanks for all your hard work! Love LOVE this idea!!!! Will taste soooooo good!!! Great idea to avoid butter!!!! Thank you for your site. I read it every day it is posted!!!! Happy Holidays....Merry Christmas....Happy New Year!!!! I love this idea and all the readers' tips. I appreciate you and your common sense approach to healthier eating. Also the fact that you have remained faithful to us and your blog even though you are achieving fame. Thank you. I'm reading, too. Sometimes I find the post on FB or Pinterest so I don't open it in my email. Happy Holidays! Lisa, thank you for not being too busy for us! 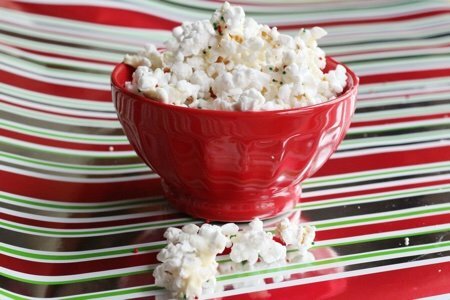 This popcorn sounds yummy :) Thank you for your blog, no matter what time if year it is! 3 pts. for 1 cup???? Looks good but not worth the points. I read you all the time and try to make comments.. There are some days for whatever reason your newsletter doesn't come over. Hi Lisa, I read every day and forward much of what you offer to people that I know could benefit from your tips and recipe ideas. I own your book and have enjoyed it for many months now. I am usually a silent fan but maybe we should be more proficient in letting you know that we are out here and loving what you do. Please keep on keeping on. Am going to help my young granddaughter make the cute little Santa hats to put along side of her homemade place cards on our Christmas table. Kudos to you and best wishes to your loved ones. I always use your microvave popcorn recipe. I even have refined the number of seconds to use when the corn is frozen (which it always is.) This is so yummy and festive and I am so thankful!!! AND, the busier I am the more I enjoy the oasis that is your blog (the only blog I read.) Thank you! Hi Lisa! Having as much fun reading the comments as the recipes! Anyone know best place to get hullless popcorn? I like where you let your dog post! I am reading and have used some of the ideas. I hope to try the Santa Hat recipe for Christmas Eve. believe it or not, we are still here.